Philadelphia may be home to guitar ace Greg Sover but he’ll be spending time in Chester County over the next few days. On August 13, Sover will have a “CD Release Party” at the Steel City Coffee House (203 Bridge Street, Phoenixville, 610-933-4043, www.steelcitycoffeehouse.com). Then, he will be back in the area August 16 to headline a show at the Eagleview Summer Concerts on the Square at Eagleview Town Center (Wharton Boulevard, Exton, www.ineagleview.com). “Right now, I’m only doing one-off shows,” said Sover, during a phone interview Wednesday afternoon from his home in Philadelphia. “Now that the album is out, we are planning a tour. Sover became fascinated with the guitar at age 13. His father taught him the French song “La Maladie d’Amour” and Sover took it from there. He taught himself how to play guitar, how to write songs and, eventually, how to sing. He has been influenced by artists in multiple genres including Bob Marley, Stevie Ray Vaughn, Dwight Yoakam, Jay-Z, Gary Moore (Thin Lizzy and others) and Jimi Hendrix. Songwriting has been an outlet for him to express his struggles and passions and he believes that his songs resonate with his fans. 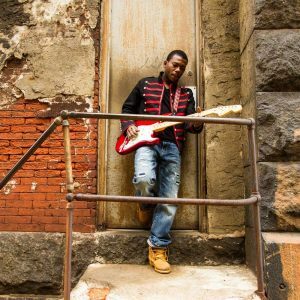 Sover first attracted serious attention when he won the 2015 Hard Rock Rising competition at Philadelphia’s Hard Rock Cafe. His development is due in large part to his band, which is comprised of three Philly veterans with extensive resumes – bassist and album co-producer Garry Lee, guitarist Allen James and drummer Tom Walling. Lee, who has played with June Rich and The Rhythm Cats Revue, is currently the bassist in the Deb Callahan Band. Lee assembled the band for Sover — enlisting James and Walling, his long-time band mates in the Deb Callahan Band. Their cohesiveness as a unit enabled Sover to develop as an artist and take his music to the next level. Sover’s favorite guitarist is a player who tops many musicians’ “favorite guitarist” list — Jimi Hendrix. “We recorded the album at two studios — one in Center City Philadelphia and one in Mount Airy,” said Sover. Video link for Gary Sover — https://youtu.be/8LAygpzHyWM. The show at Steel City will start at 8 p.m. with the Peace Creeps opening. Tickets are $15 in advance and $18 day of show. The show at Eagleview, which has Xande Cruz as the opener, will start at 7 p.m. and features free admission. The Isle of Man is a small island in the Irish Sea that is an independent country which is a self-governing kingdom — a Crown dependency that belongs to neither the U.K. nor the European Union. For the longest time, its sole claim to fame musically was that it was the birthplace of the Gibb Brothers — better known as the Bee Gees. That changed about 10 years ago with the emergence of Back Door Slam — a young trio that played a scorching style of power-packed blues. The group released its debut album “Roll Away” in the states in 2007. The driving force of that now-defunct band was vocalist/guitar ace Davey Knowles. Early in 2009, Knowles released a statement from the band, stating that they had split up, and the band’s members were going to begin to pursue their own separate careers in music. Knowles, who will headline a show at Hard Rock Café (1113 Market Street, Philadelphia, 215- 238-1000, www.hrcphillymusic.com) on August 13, released “Coming Up for Air,” his first album on his own, in 2009. He followed with “The Outsider” album in 2014. Knowles has announced the release of a new studio album “Three Miles From Avalon” on October 14. It is a collection of new songs marking a return to his roots and the sounds that first ignited his passion for music. “My last album — ‘The Outsider’ — took a long time to record,” said Knowles, during a phone interview Tuesday afternoon from a tour stop in Charlotte, North Carolina. When he was still just a child, Knowles was exposed to blues music through his family’s music collection. 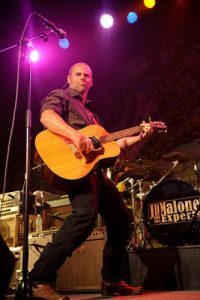 Over the years, he has become a die-hard blues fan who has fed himself a diet of music by blues artists such as Albert King, Otis Rush and Muddy Waters – as well as British blues practitioners like Eric Clapton and Rory Gallagher. “This is a real band playing live in a room,” said Knowles. “It all just came together in the studio. I wanted to go back and make a record that had that real feel — and that live intensity. “My favorite sounding records are certainly older ones, recorded to tape, with minimal fuss or overdubs. I wanted that lovely warm, vintage sound that only tape and glowing tubes can do. A raw, vintage sound is evident in the album’s opening two tracks, the hard-driving “Ain’t Much Of Nothing” and the live favorite, “What You’re Made Of,” an homage to one of his musical heroes Rory Gallagher. His fans will get a preview of a lot of the songs at this weekend’s show. Video link for Davy Knowles — https://youtu.be/PjIPuLEAke8. The show at the Hard Rock Café, which has Pawnshop Roses and Modern Colour as openers, will start at 8:30 p.m. Tickets are $25. 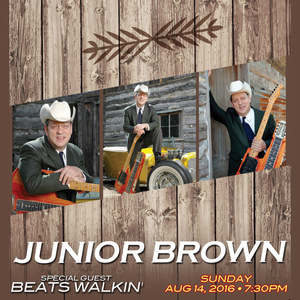 On August 14, the Ardmore Music Hall (23 East Lancaster Avenue, Ardmore, 610-649-8389, www.ardmoremusic.com) will present Junior Brown — a veteran country singer-guitarist who is a true original. Brown is known for his distinctive baritone voice and his double-necked “guit-steel,” which is a hybrid of electric guitar and lap steel guitar. Brown has been listening to and making music ever since he was very young — and his tastes are very diverse. “I have trouble listening to one certain kind of music all night long,” said Brown. “I like a variety of music. Our family travelled and moved around alt when I was growing up so I heard different regional music. I lived in Maryland until age 12 and heard country music there. Then, we moved to Santa Fe, New Mexico so I was listening to the whole mariachi thing. “Piano was my first instrument but I didn’t take to it like I did to guitar. The first time I picked up a guitar — I knew. I found an old guitar in my grandparents’ attic when I was five. Brown eventually moved to Austin, Texas to pursue a career in music. Brown made his first album in1984. His most recent studio album is “Vol.10.” which came out in 2012. Video link for Junior Brown — https://youtu.be/X76KE7LWocI. The show in Ardmore, which has Beats Walkin’ as the opener, will start at 7:30 p.m. Tickets are $30 in advance and $35 day of show. If you’re a fan of Styx and have never seen the band perform live, you really have no excuse. The band formed in 1972 and has been going strong ever since. 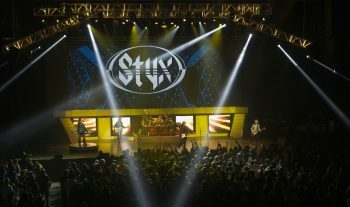 Styx is touring again this summer and will visit the area on August 15 for a show at the American Music Theatre (2425 Lincoln Highway East, Lancaster, 800-0 648-4102, www.AMTshows.com). 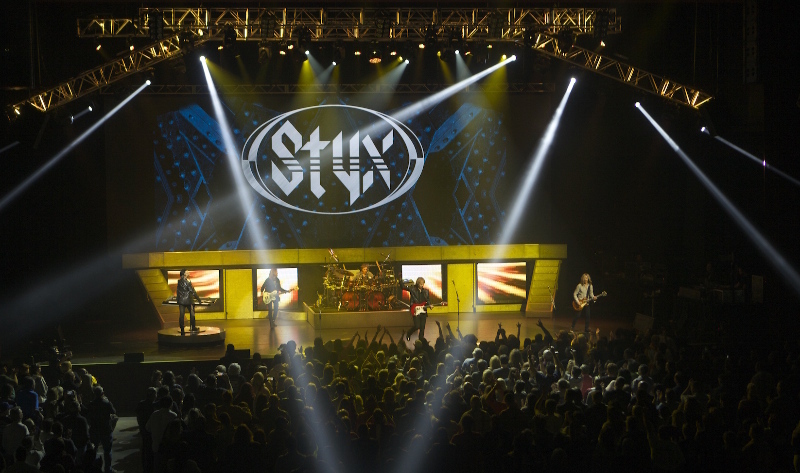 The current Styx lineup includes Tommy Shaw (vocals, guitars), James “JY” Young (vocals, guitars), Lawrence Gowan (vocals, keyboards), Todd Sucherman (drums) and Ricky Phillips (bass) — along with the occasional surprise appearance by original bassist Chuck Panozzo. Shaw and Young have been with the band since its start in Chicago in 1970 while Gowan and Sucherman joined the group prior to the turn of the century. “We are endless road warriors,” said Phillips, during a phone interview Wednesday afternoon. “We’re on the road 200 days a year and play well over 100 shows. It’s a good problem to have. “I’m the newest member of the band and I’ll start my 14th year in Styx in September. It’s a great group of musicians that complement each other. There is a lot of great talent. But, more importantly, there is this great symbiotic relationship we have. All the parts are there. Stylistically, it all melds. Everything clicks all the time. It’s just a great band. At this stage of the band’s career, Styx does not place a big emphasis on recording new material — for good reason. If Styx waits to release something new until a time when its fans are tired of hearing “Come Sail Away,” “The Best of Times,” “Show Me the Way” and “Mr. Roboto,” there might never be a new Styx album. The fans never get tired of listening to Styx’ classic hits and the band never gets tired of playing them. “We can keep things fresh because our catalogue is deep enough,” said Phillips, who had previously been a member of The Babys and Bad English and has played with Coverdale-Page and Ted Nugent. “There are songs we have to play. But, even in short sets, we can put in a couple deep cuts — songs like ‘Snowblind’ and ‘Man in the Wilderness.’ There are also places in the show where we can show our musicianship. On September 2, Eagle Rock Entertainment will release “Styx: Love at the Orl4eans Arena Las Vegas” via DVD, blu-ray and digital formats. Filmed in high definition, it captures the band performing in July 2014 with all the hits as well as fan favorites such as “Too Much Time On My Hands,” “Fooling Yourself (The Angry Young Man),” “Renegade,” and more. Video link for Styx — https://youtu.be/-Rcl5XBOoyc. The show at the American Music Theatre is scheduled to get underway at 7:30 p.m. Tickets are $79. With regard to the band Ahleuchatistas, it may be hard to say the name but it’s easy to get into the music. The band’s name, pronounced “AH-LOO-CHA-TEES-TAS,” is a portmanteau of “Ah-Leu-Cha,” the Charlie Parker song, and “Zapatistas,” the Mexican revolutionary movement. The band, which released its latest album “Arrebato” last year will visit the area on August 16 for a show at Johnny Brenda’s (1201 North Frankford Avenue, Philadelphia, 215-739-9684, www.johnnybrendas.com). 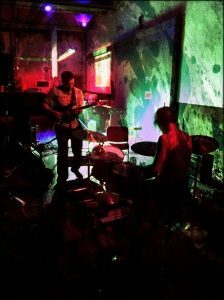 Ahleuchatistas — Shane Parish (guitar) and Ryan Oslance (drums) — are known for their trademark intensity. The duo has been meticulous in developing structure that is both elastic and labyrinthine. In the tradition of bands such as Bill Laswell’s Last Exit, John Zorn’s Naked City and Ronald Shannon Jackson’s Decoding Society, Ahleuchatistas serves up shards of sonic shrapnel and white-hot free jazz abandon along with impressionistic textures, intricate unison lines, tightly-honed motifs and disciplined, shape-shifting arrangements. The duo is definitely not your average rock and roll band. “The band started in Asheville, North Carolina in 2002,” said Parish, during a phone interview Wednesday afternoon from his home in Asheville. “Ryan and I met through myspace.com’s ‘seeking musicians’ page. This pair interweaves elements of punk rock, jazz, classical music, speed metal, grindcore, progressive rock, noise, folk music from Asia and North Africa, electronic music, and ambient aesthetics, along with volatile, unpredictable improvisation, flowing organically in a virtual world of their own. “We’re constantly evolving,” said Parish. “If you listen to the record, it started out looser. We were improvising a lot. Then we created an album — ‘Heads Full of Poison’ — that was more composed. Ahleuchatistas have a wide range of influences. “I’ve been listening to a lot of gnawa and Sufi music,” said Oslance. Video link for Ahleuchatistas — https://youtu.be/W-lEMrcElYA . The show at Johnny Brenda’s, which also features Mary Lattimore, Eric Slick, and Shimmer, will start at 9:30 p.m. Tickets are $10 in advance and $12 at the door. If the heat wave breaks by Tuesday and you’re up for an outdoor concert, you have a good option at a venue in Montgomery County. On August 16, J.D. Malone & the Experts will be performing in Lansdale as part of the White’s Road Park Concert Series (400 White’s Road, Lansdale, 215-361-8352, http://www.lansdale.org/192/Whites-Road-Park-Concert-Series). “I just released an album — ‘Town and County’ — in March,” said Malone, during a phone interview Wednesday from his home in Phoenixville. “I produced it and published it on my own. I do perform solo at times but I’m more of a band guy. The current line-up for J.D. Malone& the Experts features Avery Coffee, Jim Miades, Tommy Geddes, Nate Gonzalez and Malone. Malone not only lives in Phoenixville, he made his latest album there. “I recorded the album at The Hacienda in Phoenixville with my friend Cliff Hillis,” said Malone, who celebrated his 51st birthday this week. Video link for J.D. Malone — https://youtu.be/YuRiGBEzop0. The show at White’s Road Park in Lansdale will start at 7 p.m. and features free admission. 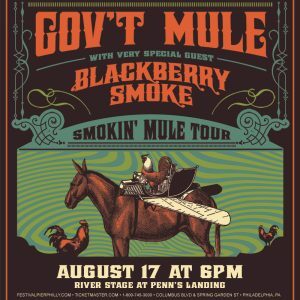 Fans of Southern Rock will be in for a treat on August 17 when the Festival Pier at Penn’s Landing (601 North Columbus Boulevard at Spring Garden Street, Philadelphia, 215- 629-3200, www.festivalpierphilly.com) hosts the “Smokin’ Mule Tour” featuring Blackberry Smoke and Gov’t Mule. Blackberry Smoke is a Southern Rock band from Atlanta, Georgia. The group formed in 2000 and released its debut album “Bad Luck Ain’t No Crime” in 2004. The quintet’s new album “Like An Arrow,” will be released October 14 on 3 Legged Records via Thirty Tigers. The lineup of Blackberry Smoke features Charlie Starr (lead vocals, guitar), Richard Turner (bass, vocals), Brit Turner (drums), Paul Jackson (guitar, vocals), and Brandon Still (keyboards). “We were all in different bands in Atlanta back in 2000 and we all ended up together,” said Starr, during a phone interview Tuesday morning from his home in Atlanta. “There is a small bunch of people who play the kind of music we play. “We’re a Georgia rock and roll band. And, much like the early Rolling Stones, we’re a band who also likes country and will occasionally play a country song. If you released Skynyrd’s second album now, it would get played on country radio. Blackberry Smoke has released five albums in 15 years and has toured virtually non-stop during that time. “We beat the bushes for awhile,” said Starr. “When we formed, we made a D.I.Y. record — ‘Bad Luck Ain’t No Crime.’ Jess James Dupree from Jackyl produced it and we went on the road with him. “Since then, we went with several indie labels and each time it soured. Major labels never came beating on our door. We’ve always been D.I.Y. We made one album with Zac Brown’s label Southern Ground and that label folded. 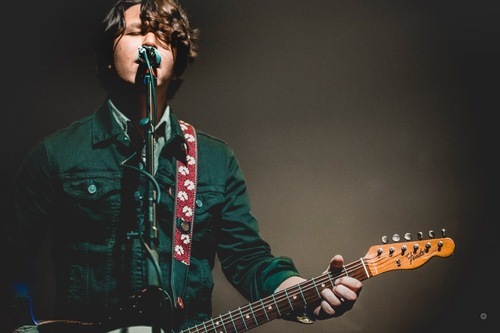 “We recorded the new album in January in Kennesaw, Georgia. I had been building up songs for awhile. I sated writing right after we released our last album ‘Holding All the Roes’ in 2015. Video link for Blackberry Smoke — https://youtu.be/fX4N8eIYbPg. The show at the Festival Pier on Wednesday will start at 6:30 p.m. Tickets are $45.